From airplanes to football helmets, some of the greatest inventions of all time have been based on the natural abilities of plants and animals. Readers will learn how some of history's most imaginative inventors were inspired by nature and how their incredible creations continue to improve our lives today. Available in reinforced library and paperback bindings. Gr 4-8-Each of these titles shows how a particular technological innovation was based on a natural source and concludes with a chapter about important people in the field. Some of the information repeats from book to book. The texts are constructed with short chapters, accompanied by sidebars with related content. Stock color photos and reproductions generally support the main paragraphs; however there is no close-up photo of shark skin in Sharks. Sometimes the link between the technology and its natural source is stronger than others, especially in the titles about bullet trains, anti-collision systems, and Velcro. 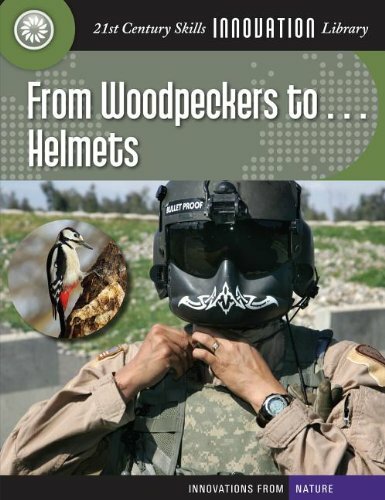 The helmet technology discussed in Woodpeckers is still under development. These should be particularly useful for students researching inventions. Although a stand-alone title such as Dora Lee's Biomimicry: Inventions Inspired by Nature (Kids Can, 2011) may cover a greater number of inventions, this series has more detail. α(c) Copyright 2011. Library Journals LLC, a wholly owned subsidiary of Media Source, Inc. No redistribution permitted.